It also has a countdown timer and a stopwatch. The tab "Add / Edit Alert" allows you to create and edit your own alerts. It also allows you to use the countdown and stopwatch built into this program. 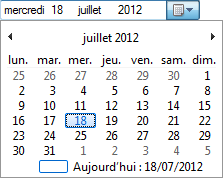 The date can be changed by an integrated calendar. 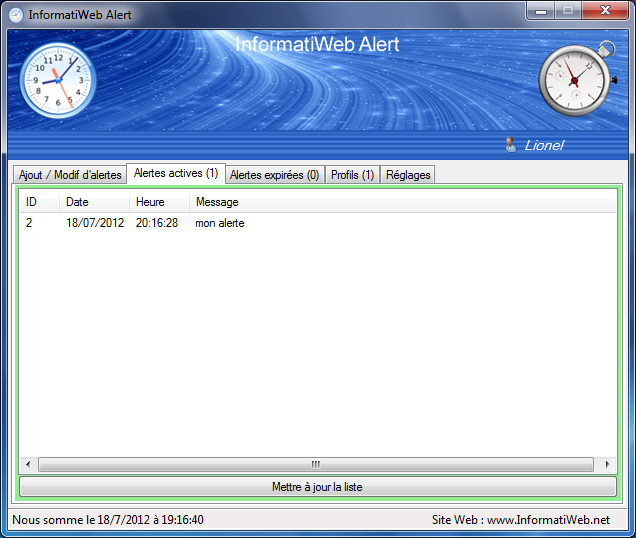 The remaining countdown time can be displayed in a bubble by clicking on the program icon next to the time (Systray). - whether "failed" when the alert should be triggered when the program was not running. 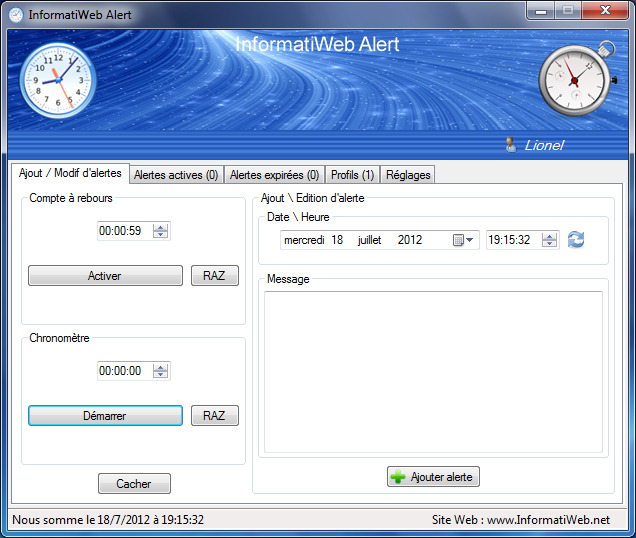 (For example, if the computer was not on at that time). You can "Edit" or "Delete" a your alerts by right-clicking on the alert in question. If you click "Edit" the program will switch in the "Add / Edit Alert" to allow you to edit the selected alert. The "Profiles" tab lets you know the profiles created by this program. 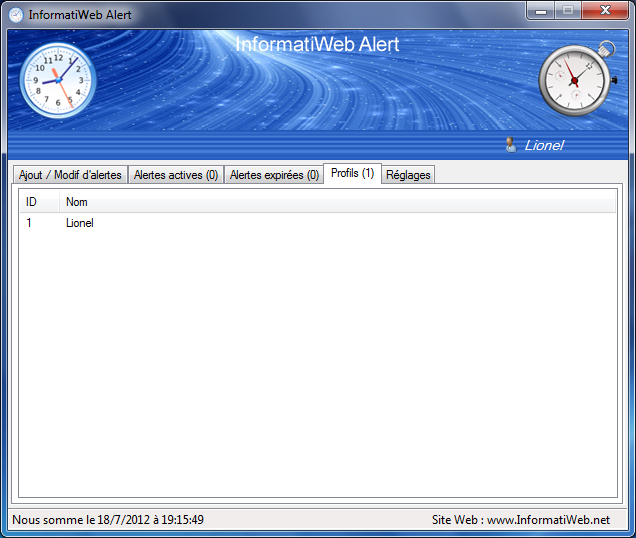 A profile contains all the settings and alerts you create. So everyone has their own data. Your profile is created at first start the program with the name of your Windows session. 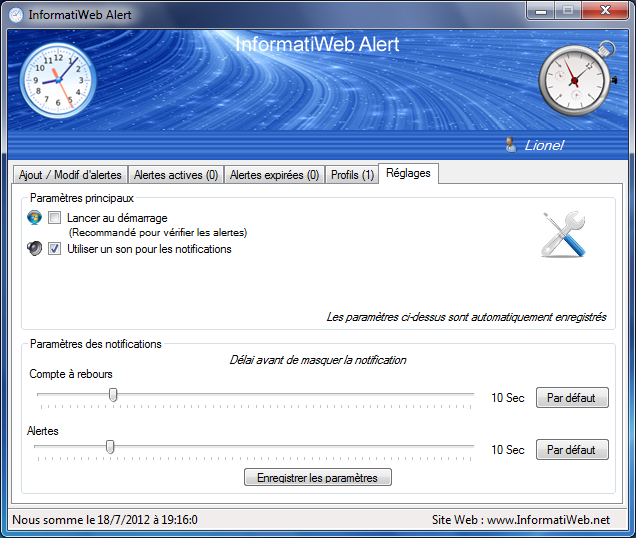 The "Settings" tab allows you to add "InformatiWeb Alert" when Windows starts (recommended to check alerts), play a sound when a notification and set the time displays notifications. These settings are saved in the current profile. 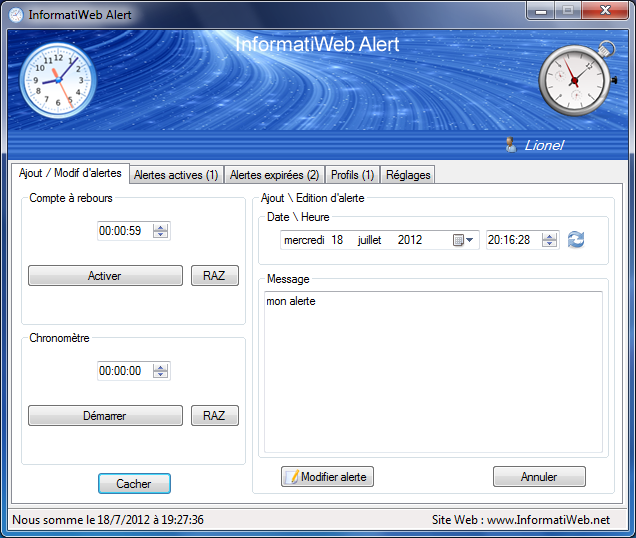 Profiles and alerts are in the database "alertes.mdb" created the first launch of the program, which is protected by password not that another user can not see your alerts and settings. Notifications are displayed in the lower right corner of your screen and automatically hides after the time set in the settings (default is 10 seconds). The program must be run as Administrator if it's in the "C" partition. To do this, simply right-click on the program and click "Run as administrator". Or click "Properties", go to the "Compatibility" tab and check "Run this program as an administrator" and then click OK to apply the changes.